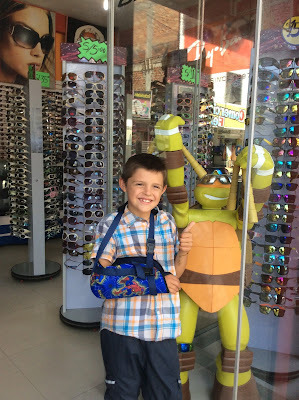 On July 1 Malachi came home from school with a broken arm. His class had gone for a walk in the jungle for science class. Malachi decided to climb a rock wall when his teacher asked him not to. As he was climbing he fell off the wall and landed on his arm. We knew instantly when we saw him that his arm was broken. We splinted his arm with our splint and took him to the doctor. Our town in Caspizapa has a doctor but they do not have access to an X-ray machine. After a few hours of waiting we were given an order for a X-ray and Taylor headed to Picota to try to get one done. The doctor there decided Malachi’s arm didn't look broken so he wasn't going to do the X-ray. Praise the Lord we work with two amazing priests. Padre Leopoldo and Padre Paco were not going to take no for an answer. The next day Taylor and Malachi were going to head to Tarapoto for a X-ray. Tarapoto is an hour and a half drive from our town. Our region’s hospital is in Tarapoto. Taylor was met in Tarapoto by Madre Clarece. Madre Clarece is a doctor and a sister who serves there. She was able to walk right into the hospital and demand a X-ray. The X-ray confirmed our thoughts. Malachi had a fracture in his arm right below his wrist. After receiving the diagnosis Madre Clarece, Taylor, and Malachi had to travel across town to find a splint and sling. They were able to locate the one store who sold them and purchased the items. They then had to return to the hospital for the doctor to approve them. Once they were approved the doctor sent them to the store to purchase more milk and yogurt before they could head home. Malachi was very proud of his spiderman sling but the excitement of having a broken arm slowly wore off during the next three weeks. On July 23 Taylor and Malachi returned to Tarapoto for a follow up X-ray. 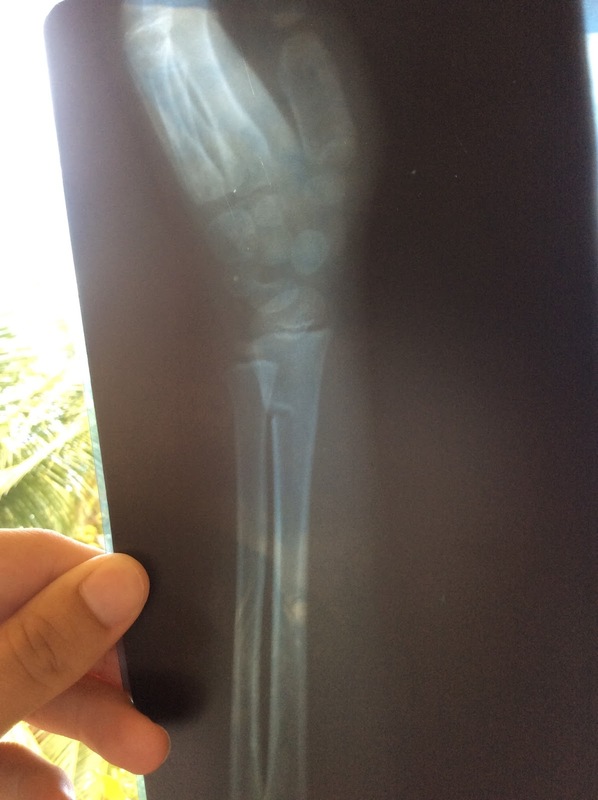 The X-ray showed that his arm was healing but that it needed more time. The doctor once again sent Taylor to the store for more milk and yogurt before sending them home. In three weeks it should be healed. August 12 our whole family drove into Tarapoto to bring Padre Paco to the airport. He was headed home to visit his family for a month. The drive into Tarapoto was exciting that morning. The night before we had our first rainstorm in over a month. This caused a major mudslide on the road. Some semitrailers were turned sideways and now blocking the road. How were we going to get into Tarapoto in time to get Padre to the airport and Malachi to the doctor? We came to the Lord in prayer and he provided. The semitrailers had just been moved out of the way and now our line of traffic heading to Tarapoto were the first to go. Praise you Jesus!!! Padre Paco didn’t miss his flight and we were able to see the doctor. The good news ended there however. 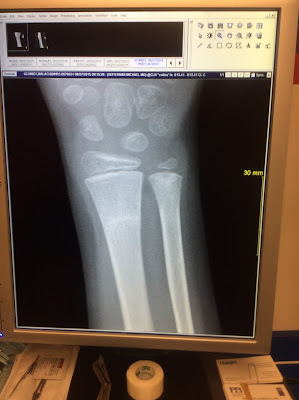 After Malachi’s X-ray we were told his arm was actually worse than it was initially. The fracture was wider now than it had been. The doctor said that there was nothing else he could do without surgery. We thanked him for his help and headed home. I immediately contacted our wonderful friend Anthony Luczak for help. I emailed him the X-rays and he went to work looking for an orthopedic surgeon who could squeeze us in on short notice. We were heading back to the states on August 25 and were hoping to have his arm fixed as soon as we arrived. Our appointment was set for August 27. Fast forward to August 27. We were driving from Abbeville to New Orleans. During our drive we once again implored God’s help with healing Malachi’s arm. We came to Him pleading for the healing but only to show His glory to the world. Malachi was quiet most of the drive. He was trying to take in the thought of having his arm broken and cast. Our first stop was to X-ray. Malachi and Taylor headed in as I filled out all of the paperwork. We were then whisked away to the exam room. As we were waiting in the room Malachi broke down and started crying. He was pleading that he didn't want to have his arm in a sling for another six weeks. Just as he was in the middle of his sobbing the doctor walked in. He could see that Malachi was distraught. He asked Malachi why he was so upset and Malachi could only blubber that he doesn’t want a broken arm. The doctor then asked him why he was holding his arm like a robot, so stiff. Then he proceeded to do the robot. He then asked Malachi to come off the table and to give him a high five. Malachi gave him one with his left hand. The doctor laughed and said no with your other arm. Malachi was surprised and lightly tapped the doctor’s hand. The doctor said harder, so Malachi did it. Again the doctor said harder and Malachi slapped his hand. At this point both Taylor and I were sitting there chuckling with our mouths wide open. I swear my mouth was hanging on the floor. I could hear Taylor say “Oh God you are so funny.” The doctor then looked at us and asked if we had prayed over Malachi. We said that we had. He then said “Then you know exactly what this is. His arm is perfectly fine.” At this point Taylor asked to see the X-ray. 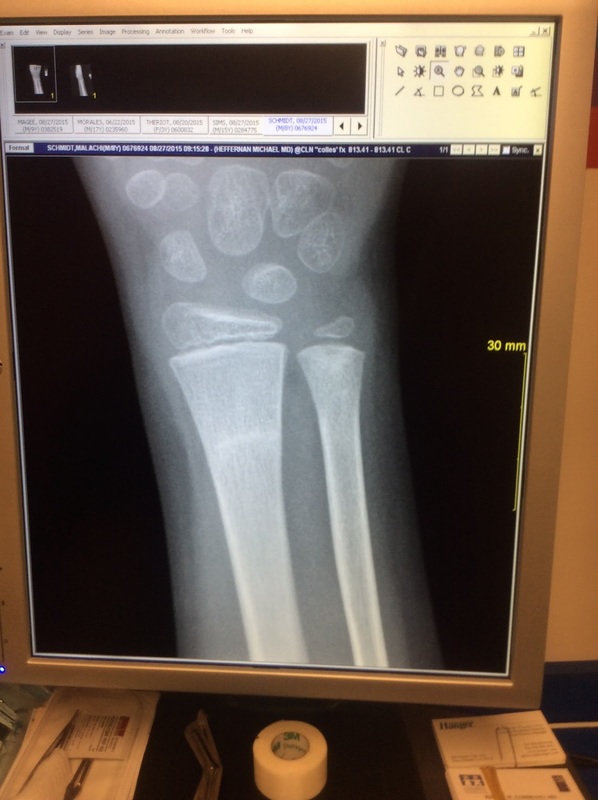 When we went to see the X-ray we could see it was completely healed. You could hardly see where the break was and there is no calcification on the bone. We truly do serve a real God who does real things for real people in the real world. We are overjoyed to be able to sing His praises and humbled that He has shown His glory through Malachi’s healing. God bless. Malachi is one special little boy. I'm praying for you guys everyday.